"As bit rates and network traffic increase, telco and data center operators are deploying new architectures that add a flexible layer of optical switching to better manage the capacity necessary to meet those demands. 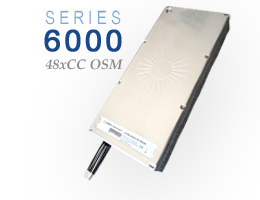 With superior optical performance in a compact form factor and an attractive price point, the Series 6000 OSM is an ideal product for OEM's seeking to add dynamic fiber layer cross-connects to their networking equipment," said Gerald Wesel, Polatis CEO. The Series 6000 OSM is being demonstrated for the first time this week at ECOC 2015 in Valencia, Spain at Stand #331, alongside the Polatis range of single and dual-sided optical switches, including the recently deployed 1U high 16-channel 1+1 Protection Services Switch. Additionally, Polatis is hosting on the stand the first demonstration of the European DISCUS project's 10Gb/s long reach passive optical network, where dynamic fiber layer connectivity is used to provision resources on demand via a software defined network (SDN) controller and provide automatic failover between dual-homed bidirectional optical line terminals. "With easy integration of a software-controlled fiber layer under an SDN control plane, traffic that doesn't require higher-layer packet inspection and grooming can be routed directly on the fiber. This creates a more efficient, higher-performing network that can dynamically allocate network resources when and to where they are needed most," said Nick Parsons, CTO and VP of Engineering at Polatis. "The low loss and dark fiber connectivity of the series 6000 DirectLight platform enables multi-stage optical switch fabrics to be created within the restricted power budget of low cost transceivers that can scale to provide simultaneous non-blocking reconfiguration of over 12,000 endpoints without concatenation of switching delay." Polatis is the first optical circuit switch vendor to release a NETCONF interface and associated YANG models required for integration with transport SDN and network functions virtualisation (NFV) management platforms. Polatis will be demonstrating at ECOC how the NETCONF interface integrates easily with the OpenDaylight SDN controller. NETCONF adds to the Polatis range of embedded SDN and network management interfaces that include OpenFlow, REST, TL1 and SNMP. Series 6000 optical circuit switches can be deployed in a Software Defined Network under an OpenFlow or NETCONF enabled control plane, which allows data center and network operators to reconfigure the fiber layer on demand to deploy capacity where and when it is most needed. Polatis delivers the world's lowest loss all-optical switching solutions for remote fiber-layer provisioning, protection, monitoring, reconfiguration and test, with over 2 billion port-hours accumulated in service to date. Dependable, field-proven DirectLightTM optical matrix switch technology scales from 4x4 to 192x192 ports, applying class-leading performance to provide dynamic optical networking for telecommunications, data center, government, test and video markets. For more information, please visit www.polatis.com.